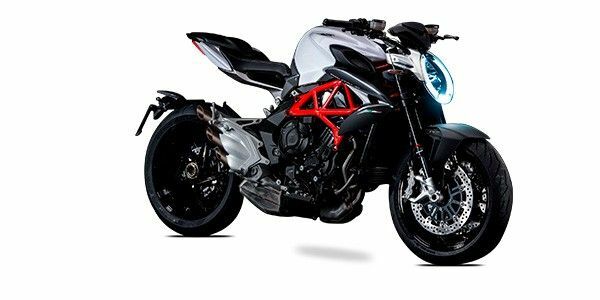 The MV Agusta Brutale 800 will be the cheapest bike to be offered by the Italian bikemaker in the Indian market and has been priced at Rs 15.59 lakh (ex-showroom, pan India). The Brutale 800 coming to India is the second generation of the middleweight naked motorcycle that was first showcased at the 2015 EICMA motorcycle show in Italy. The Brutale 800 is the naked version of the MV Agusta F3 which is on sale in the Indian market and has been designed by Adrian Morton who succeeded the legendary Massimo Tamburini and the British designer has done a great job. The Brutale 800 has the design silhouette of the bigger MV Agusta Brutale 1090 but it has been tightly packaged with more edgy lines. The oval shaped headlight profile remains but it now receives LED DRLs that give it a modern touch. The sculpted fuel tank, contrast red trellis frame, single-sided swingarm and the iconic triple exhaust mufflers endow the bike with Italian design flair for which the brand is renowned for. But the party piece has to be the floating tail section that takes your breath away. Switchgear has also been revised and so is the new instrument cluster which is much more legible than its predecessor. Powering the bike is a new 798cc triple engine that meets Euro IV emission norms. The new motor develops 110PS of power at a rather high 11,500rpm and peak torque of 83Nm is made at 7,600rpm. The engine is mated to a 6-speed gearbox with slipper clutch and the new bike also gets bidirectional quick shifter. Talking about electronics the new MV Agusta Brutale 800 features 8 traction control levels, 3 ABS levels and engine braking control. There are four riding modes on offer, Rain, Normal, Sport and Custom. The 2017Brutale 800 is expected to be priced around Rs 15 lakh ex-showroom. MV Agusta Brutale 800 prices start at Rs. 15.60 lakh (Ex-Showroom). MV Agusta Brutale 800 is available in 2 variants and 4 colours. Share your experiences with Brutale 800?